Crestron has announced the installation of its 50,000th DigitalMedia switcher. Whitlock CEO Doug Hall (left) and Crestron EVP Randy Klein. AV solutions provider Whitlock installed the milestone switcher at a U.S. Army base in Newport News, VA. The U.S. Army needed a digital solution for their training facilities across the country and called on trusted dealer, Whitlock to provide the solution. DM was selected because it accepts both analog and digital signals and meets the stringent security and reliability requirements of the U.S. Army. 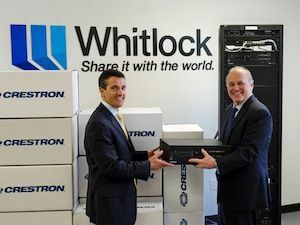 Whitlock’s partnership with Crestron and extensive knowledge of the DigitalMedia line has been instrumental in the integrator's growth and success. Whitlock has been able to put more than 130 employees through certified technical training programs, and has significantly increased its technical awareness and expertise with regards to digital systems integration. Whitlock has worked closely with Crestron for more than twenty years. The integrator has implemented hundreds of DigitalMedia systems for their clients.